Type: Fiat R.A.1050 RC 58 Tifone (licenční výroba DB 605A-1) o vzletovém výkonu 1 085kW. Vrtule trojlistá Piaggio P.1001 s konstantní rychlostí otáček o průměru 3 050 mm. Fiat R.A.1050 RC 58 Tifone, (license-built Daimler-Benz DB 605A-1) twelve-cylinder inverted vee liquid-cooled engine, rated 1,475 hp at take off. Driving three blade Piagio P2001 constant-speed propeller of 10 ft diameter. 2x pevný kulomet Breda-SAFAT ráže 7,7 mm v křídlech 500 nábojů pro každý. two fixed forward-firing 0.303 inch Breda-SAFAT machine guns mounted in the wings 500 rpg. Bomb load: two 353 lb bombs. Note: MC205 Veltro serie II měl být vyráběn továrnou Fiat, továrna byla poškozena bombardováním a tak bylo pravděpodobně vyrobeno (pokud vůbec) jen pár letadel. 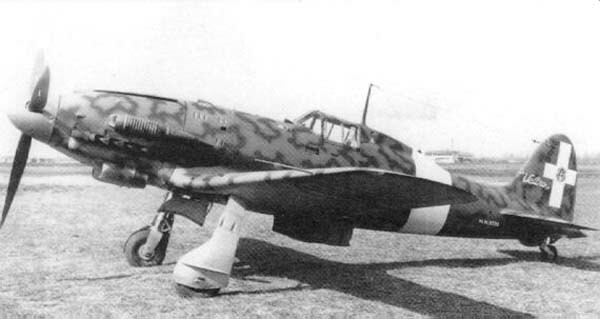 The prototype flew to Guidonia, where it was put into trials against the other fighters of the so-called Serie 5 Fiat G55/0 and the formidable Reggiane Re.2005 Sagittario, all of them built around the powerful Daimler-Benz DB 605 engine. The Macchi C.205V was good at low and medium altitudes, fast and with good diving characteristics but its performance dropped considerably over 26,250 ft, particularly in handling. Sources: Famous Fighters of the Second World War-2, London, Macdonald, 1962, No ISBN. William Green, War Planes of the Second World War: Fighters, Volume Two. London, Macdonald & Co. Ltd., 1961, No ISBN.